Photos from CIAA 2010 (courtesy Rogério Reis). Click here for arrival information for CIAA 2010. 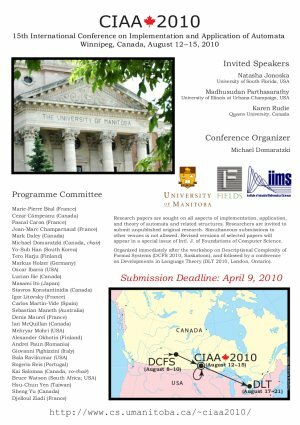 The 15th International Conference on Implementation and Application of Automata will be held at the University of Manitoba in Winnipeg, Manitoba, Canada on August 12-15 2010. DCFS 2010 (Saskatoon), DLT 2010 (London, Ontario) and CIAA 2010 will be organized to allow attendance at all three conferences in August 2010. Department of Computer Science, University of Manitoba.